Most students have had the experience of knowing an answer, but they are unable to access the information in a stressful moment. This is a common difficulty when students are taking a test, as anxiety can block recall. In fact, one may be able to recall the first letter of a name they are trying to conjure from memory but fail to retrieve the whole word. In addition, they may be able to describe the word or concept but only call to mind similar words or concepts. The brain is much like a filing cabinet, storing information that you have learned, and if a student quickly packs information into their head in a random or disorganized fashion, uncovering the needed material can be a challenge. Like finding a favorite shirt in a messy room, a student may waste a lot of time searching for the right word, or even worse, they may not be able to demonstrate their knowledge when called upon in class or when recording answers on a test. This can be frustrating and discouraging. However, if students take the time to sort the novel information and make connections, recollection can improve significantly. 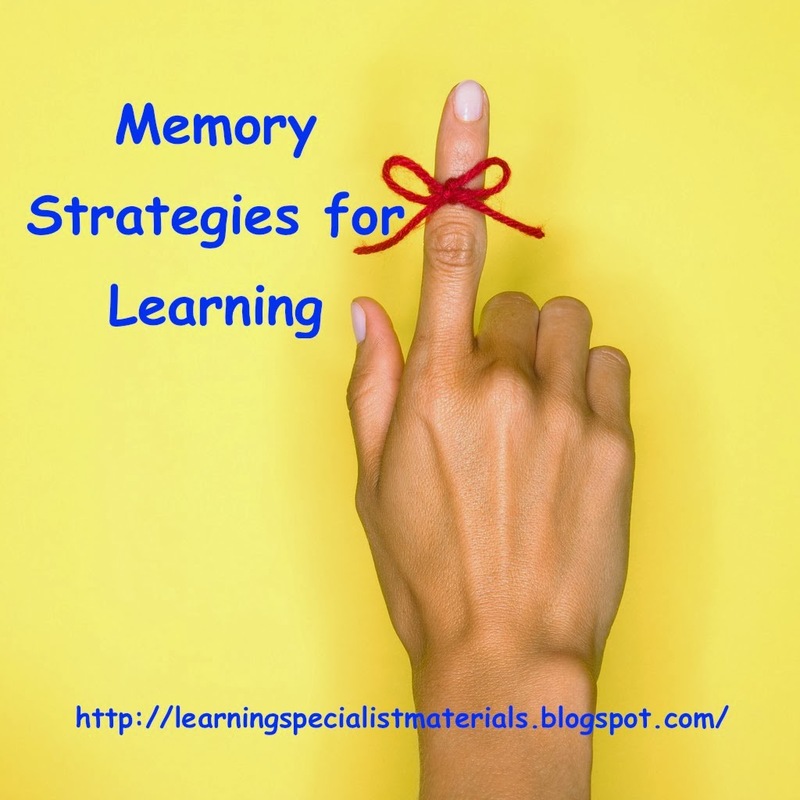 Memory strategies are tools that help students organize information before they file it away in their minds. The following will introduce you to a variety of memory strategies that can assist students with the learning process, so that they can save time, achieve better grades and gain improved confidence in their ability to demonstrate their knowledge. Make Connections: Making connections between new information and prior knowledge can help students learn and encode novel material in an organized fashion. Chunking: Chunking allows students to organize material into manageable units. Looking For Patterns: Looking for patterns in new material can also aid in some learning situations. Tell a Story: Creating a story about the information to be learned can help with both memory encoding and retrieval. If stories are humorous, it’s even better. Rhymes: Rhymes use a poem or verse that has a pattern of sounds, especially at the ends of lines. Creating rhymes with academic content embedded can make recall an easier process. Create a Visual Association: Visual associations allow students to connect a mental or drawn image with the information memorized. Create an Auditory Association: Auditory associations can help with learning vocabulary. A word may sound like something that reminds you of it’s meaning. Graphic Organizers: Graphic organizers are also called Mind Maps, Concept Maps and Flow Charts. They are all illustrative ways to organize information and thoughts. They are powerful tools that help students make connections and see the big picture. Acrostics: Acrostics are short sentences that use the initial letter of each word or phrase to be memorized. Hooking: Hooking is a method that helps students connect the question to the answer so that information is stored in the same location and can be easily accessed. This is a great strategy for remembering vocabulary words because the answer is embedded in the question. Verbal Rehearsal – Teaching Material: Some students are assisted when they are able to process information aloud. Many individuals do not really know what they are thinking until they have had the opportunity to articulate it. Being able to discuss new topics, or even teach the material to others, can be an effective way of securing information into one’s memory. Songs: Songs are wonderful tools that can assist students in memorizing mundane facts.